Good Condition - Complete. Ticks against inventory. LEGO Classic Red 10707 - Parts- Car - New Without Box New without original packaging. Item may be delivered partly assembled to keep postage costs low. If you have any questions please do not hesitate to contact me. Thanks for looking. Lego Creator Mini Modulars. Set 10230 From 2012. AS THE MAJORITY OF OUR LEGO IS PRE-OWNED, OUR LEGO GRADING SYSTEM IS THIS LOT CONSISTS OF A LEGO SET 40-1 Universal Building Set AS PER TITLE. ANTENNA IS MISSING (PART 3144 Milky White Antenna with Side Spokes IS REQUIRED TO COMPLETE THIS SET). LEGO 75955. 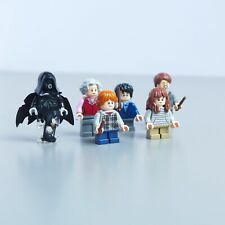 SPLIT FROM HOGWARTS TRAIN SET 75955. THIS LOT CONSISTS OF A LEGO SET 6267-1 Lagoon Lock-Up AS PER TITLE. Sets: Pirates: Pirates I: Imperial Soldiers AS THE MAJORITY OF OUR LEGO IS PRE-OWNED, OUR LEGO GRADING SYSTEM IS THEY MAY HAVE SCRATCHES, TEETH MARKS, SLIGHT DISCOLORATION OR NOT BE AS SHINY AS THEY ONCE WERE, BUT UNLESS OTHERWISE STATED THEY WILL NOT BE BROKEN AND THE PIECES WILL STILL FIT TOGETHER. 100% complete with instruction booklet. Nice clean set in good condition. A great Creator Lego Set From 2014, no longer in production. This is the 3 in 1 Turbo Quad Set which can be built in so many different ways. Detailed Instructions for three models are included, in two instruction books, but plenty of other variations are possible, as with all Lego. Set contains 186 pieces of Lego, all in good condition, just four curved slopes of which have been colour substituted (but in the same colour scheme - grey instead of yellow). Apart from this minor substitution all other pieces are present and correct. From a smoke free home. Write, draw and build with this sturdy notebook, featuring a hardback cover with a baseplate and over 55 LEGO pieces to create a Batman logo or make letters and numbers. The notebook has 96 lined pages. Measures 12” (32cm) long and 7” (19cm) wide. Christmas tree ornament, full of red Lego bricks with a red ribbon for hanging. Also opens easily, so you can remove the LEGO bricks. Contains 30 Lego pieces. Measures approximately 7cm wide. Lego Duplo Spiderman set 10607 Web-Bike Workshop 100% complete, no box included. In very good condition. See my other items for more Duplo. From a pet and smoke free home. THIS LOT CONSISTS OF A LEGO SET 7035-1 Police HQ AS PER TITLE. AS THE MAJORITY OF OUR LEGO IS PRE-OWNED, OUR LEGO GRADING SYSTEM IS Sets: Town: World City: Police THEY MAY HAVE SCRATCHES, TEETH MARKS, SLIGHT DISCOLORATION OR NOT BE AS SHINY AS THEY ONCE WERE, BUT UNLESS OTHERWISE STATED THEY WILL NOT BE BROKEN AND THE PIECES WILL STILL FIT TOGETHER. The Lego has been played with but is still in excellent Condition. - Practice flying and earn a pilot's diploma! No Box but includes the build guide to construct. - Rebuild and create new ways to play! AS THE MAJORITY OF OUR LEGO IS PRE-OWNED, OUR LEGO GRADING SYSTEM IS THIS LOT CONSISTS OF A LEGO SET 315-1 Basic Building Set AS PER TITLE. Sets: Universal Building Set: Basic THE PIECES MAY HAVE SCRATCHES, TEETH MARKS, SLIGHT DISCOLORATION OR NOT BE AS SHINY AS THEY ONCE WERE, BUT UNLESS OTHERWISE STATED THEY WILL NOT BE BROKEN AND THE PIECES WILL STILL FIT TOGETHER. THIS LOT CONSISTS OF A LEGO PART SET 9470-1 Shelob Attacks AS PER TITLE. THIS PART SET CONSISTS OF GOLLUM WITH KNIFE AND FISH, WITH THE COMPLETE CAVE/RUINS PIECE. Sets: The Hobbit and the Lord of the Rings: The Lord of the Rings. You are looking at LEGO Creator Wind Up (4093); complete. Bricks complete and in VGC. ALT No 110-1 Universal Building Set (YEAR RELEASED 1977) USA VERSION. AS THE MAJORITY OF OUR LEGO IS PRE-OWNED, OUR LEGO GRADING SYSTEM IS THIS LOT CONSISTS OF A LEGO SET 10-2 Universal Building Set AS PER TITLE. Lego pirates of the Caribbean water fountain with accessories. Please see actual pictures what you will receive. Water fountain complete with all original parts. No mini figures or manual or box. Only uk bidders please. From pet and smoke free home. Pls see pictures...lego is in great condition...all the important stuff seems to be there. I did notice that the red bike is minus it's wheels...but looks fine as in for a refit ;) Buildings are complete..only a few minor pieces missing from the bikes, e.g. a white antenna One extra minifig. Box in great condition also. I have some similar sets to list in the coming days. NEW LEGO AS TITLE AND PICTURE. LEGO SENT IN CLEAR GRIP SEAL BAGS & PADDED ENVELOPES. LEGO Sets: Classic Town: Food & Drink: 6601-1 Ice Cream Cart (1985) 100% YumYum! Sets: Town: Classic Town: Food & Drink AS THE MAJORITY OF OUR LEGO IS PRE-OWNED, OUR LEGO GRADING SYSTEM IS THE PIECES MAY HAVE SCRATCHES, TEETH MARKS, SLIGHT DISCOLORATION OR NOT BE AS SHINY AS THEY ONCE WERE, BUT UNLESS OTHERWISE STATED THEY WILL NOT BE BROKEN AND THE PIECES WILL STILL FIT TOGETHER. Join the LEGO® fire-fighting team ! With easy instructions for a fire station and ladder truck and plenty of extra building ideas, you can build almost any fire-fighting scene you can imagine ! All our genuine Lego parts are in good used condition. Lego Friends 41091 Mia's Roadster With Original Box In Exc Condition. Condition is Used. Dispatched with Royal Mail 2nd Class. LEGO Pirates of the Caribbean 4191 The Captain's Cabin. Condition is Used. Dispatched with Royal Mail 2nd Class. AS THE MAJORITY OF OUR LEGO IS PRE-OWNED, OUR LEGO GRADING SYSTEM IS THEY MAY HAVE SCRATCHES, TEETH MARKS, SLIGHT DISCOLORATION OR NOT BE AS SHINY AS THEY ONCE WERE, BUT UNLESS OTHERWISE STATED THEY WILL NOT BE BROKEN AND THE PIECES WILL STILL FIT TOGETHER. LEGO Sets: Creator: Model: Traffic: 4891-1 Highway Haulers (2006) 100% 6 IN 1! 4891 Highway Haulers was a Creator set released in 2006 which includes 209 pieces. It included directions for six models; two easy, two advanced and two expert. The advanced models are a dump truck or F-1 car. Good Condition - All pieces looked to be there. May be missing stickers, may be dusty in parts. Lego Friends Set 41341 Andrea's Bedroom Set. No Box but includes instructions. LEGO Harry Potter Aragog in the Dark Forest (4727). THIS LOT CONSISTS OF A LEGO SET 4104-1 IMAGINE & CREATE BUCKET AS PER TITLE. AS THE MAJORITY OF OUR LEGO IS PRE-OWNED, OUR LEGO GRADING SYSTEM IS SUPPLIED IN A NON-LEGO PLASTIC TUB. THEY MAY HAVE SCRATCHES, TEETH MARKS, SLIGHT DISCOLORATION OR NOT BE AS SHINY AS THEY ONCE WERE, BUT UNLESS OTHERWISE STATED THEY WILL NOT BE BROKEN AND THE PIECES WILL STILL FIT TOGETHER. Sets: Technic: Expert Builder 2 x 3705 Black Technic, Axle 4. 2 x 3713 Light Gray Technic Bush. 1 x 4185 Light Gray Technic Wedge Belt Wheel (Pulley). 2 x 3647 Light Gray Technic, Gear 8 Tooth Type 1. Presented here is a used, LEGO #5865: Creator 3 in 1 - Mini Dumper. This kit from 2010 is no longer available from Lego. LEGO discolours when subjected to sunlight and is generally played with by children. You will receive all 3 of these brand new lego parts as shown in the photo. Sets: Legoland: Building THIS LOT CONSISTS OF A LEGO SET 608-1 Kiosk AS PER TITLE. AS THE MAJORITY OF OUR LEGO IS PRE-OWNED, OUR LEGO GRADING SYSTEM IS RELEASED IN THE YEAR 1971. THE PIECES MAY HAVE SCRATCHES, TEETH MARKS, SLIGHT DISCOLORATION OR NOT BE AS SHINY AS THEY ONCE WERE, BUT UNLESS OTHERWISE STATED THEY WILL NOT BE BROKEN AND THE PIECES WILL STILL FIT TOGETHER. Great toy in very good condition. Set 31010 From 2013. Lego Creator. CREATOR : TRANSPORTATION. Set appears complete with all pieces present except that one piece has been substituted. Piece should be reddish-brown - a brown piece has been substituted. An set of small wheels has been included as a bonus. Lego and instructions very good condition.